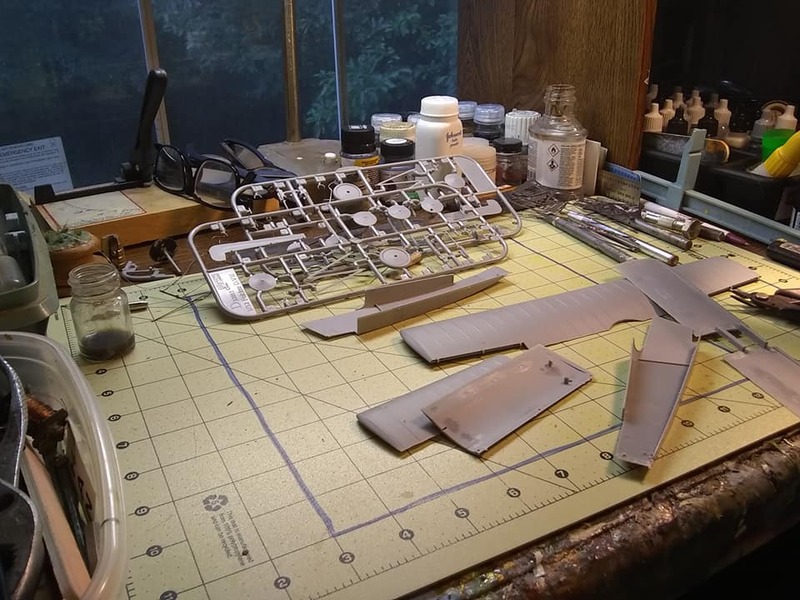 We are always excited and impressed to see the astonishing models made by our members but we don't often get a glimpse of the workbench where these works of art come to life. 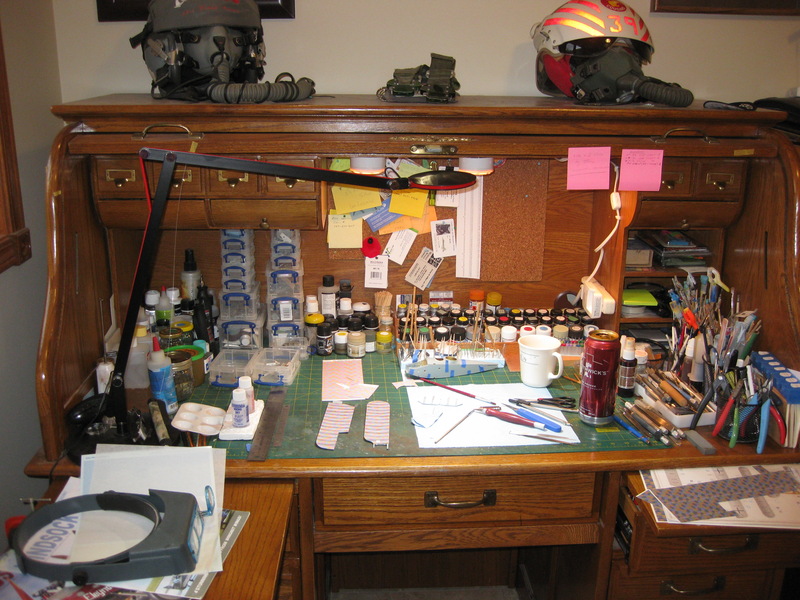 So it's time to relax and show everyone your workbench/ model desk and don't be worried if your work area is a bit cluttered and untidy. Here's my happy place in Surfers Paradise, Queensland, Australia. It always resembles a war zone and at the heart of this organised mayhem a Wingnut Wings Clerget Camel is emerging. So let's see what everyone else's model building space looks like! But in my defense, I'm preparing for Telford. 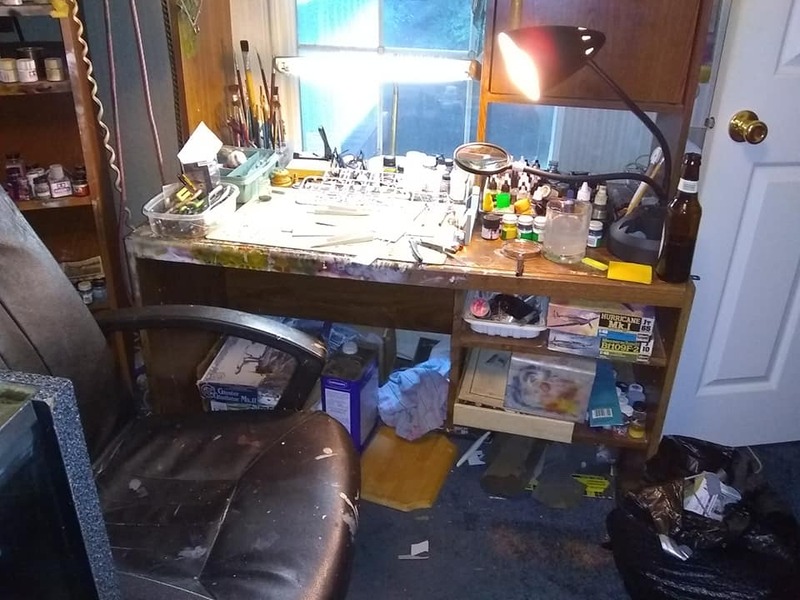 You caught me with a clean bench, which in itself is worth a photo. I have been a bit under the weather as I just had all my teeth out to make room for dentures that don't fit, so the bench has stayed clean for 24 hrs now. I'm sure I'll be back to messing it up soon. Here is mine during a major cleanup and reorganization. One of the 4 bags of trash and junk I removed can be seen on the right of the first photo I cleaned up more after the photos were taken. I now understand why I like the opportunity to view fellow Builder's work areas; it makes me feel normal and less guilty about the general mess and chaos in my own space! 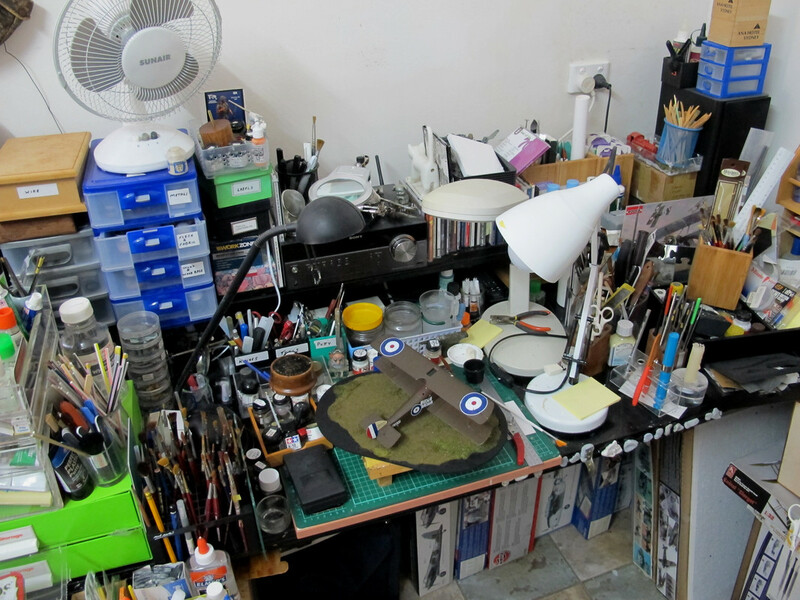 With the exception of Des' pristine working environment my "Happy Place" as Dave has called it is pretty average when it comes to clutter. 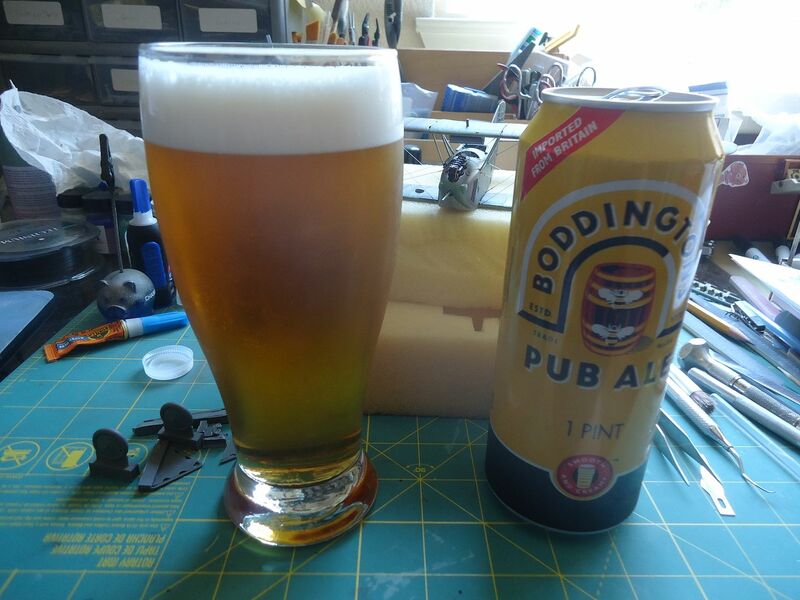 I compliment Bud on his effort to spruce up his bench with a cold imported Ale, my desk is no stranger to that sort of addition and I'm not even scheduled for Telford this year! 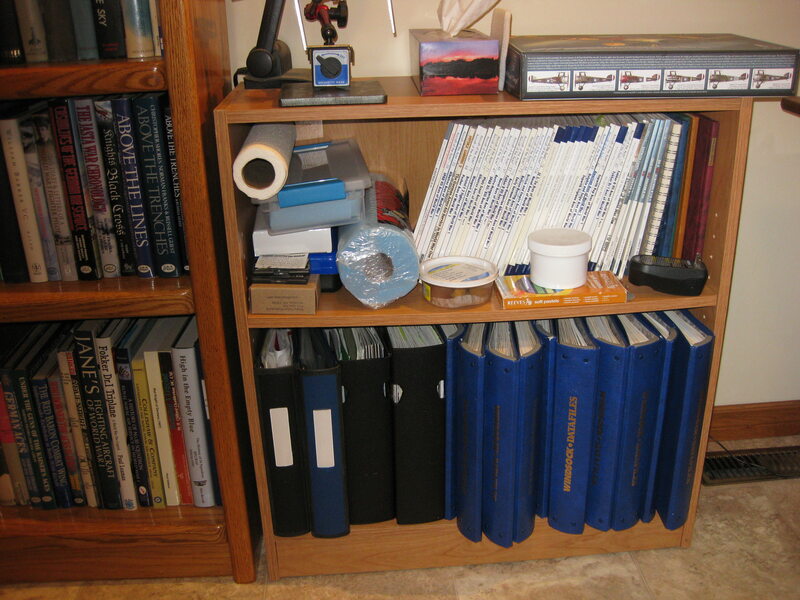 I have taken possession of our small (9 X 10 feet) Den as my Model display and work space, Computer, and Aviation Library room and placed my lifetime collection of "I love me" photos and keepsakes around the perimeter to remind me I wasn't always a 70 plus year old with arthritis, a heart condition, and 25 extra pounds to drag about daily! 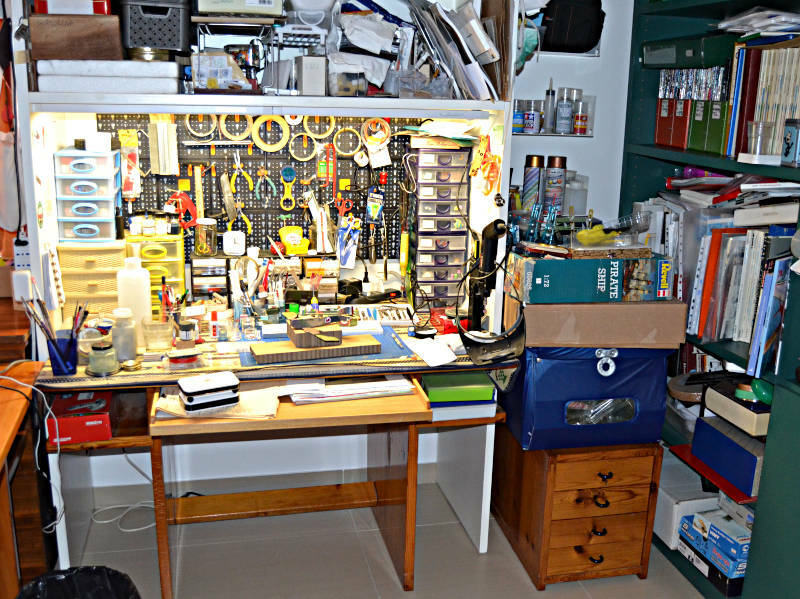 My "Bench" is a converted old roll top desk and I do my air brushing and soldering in the heated attached garage. I can only fit roughly half my collection in the room's self built display cases thus I have a large Ikea cabinet in the basement Family Room area for the rest and another will be required imminently. Here's the Bench after a serious clean up in January of this year. ..... and here's a candid shot of the Bench as she was this morning, complete with the evidence of a good Irish Red Ale consumed last night while I pondered the next move on the LVG. Great idea Dave, I hope to see many more posts here! 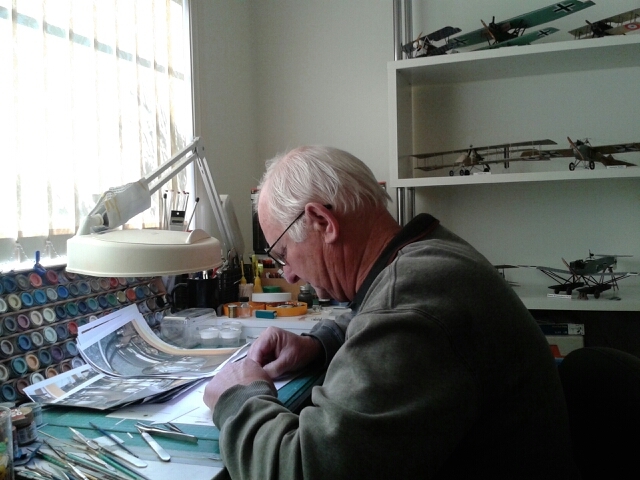 Dave has referred to the wonderful models that we see on this site and where we make them. I do not know whether space correlates with quality of product but here is my space, the core of which is the tray which measures 12inches (30cm) x 9 inches (22cm). The photo shows about 1/2 of the space on my desk. 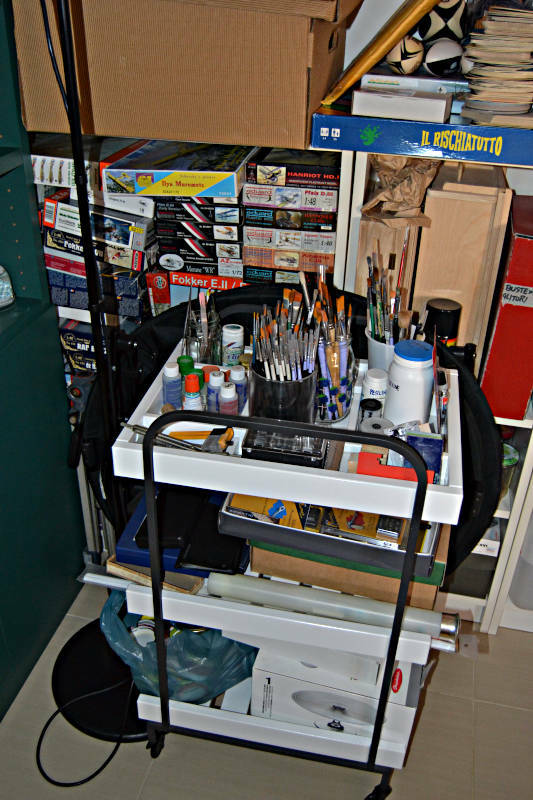 I do have some drawers in a small cupboard in the corner of the room where I store other paints, plastic sheet, rod, strip, etc, and a couple of old series 1 Airfix kit boxes with scrap and various bits which I am working on, but otherwise this is it! It may account for the small size of most of my models. When I was building the base for the Dornier flying boat I had to put it on the floor of the room in which I work. The room doubles as a study/writing area and my desktop computer on one side of the desk (not visible in photo): I have to be able to move my modelling area away during the day so that I can use the space to work on. 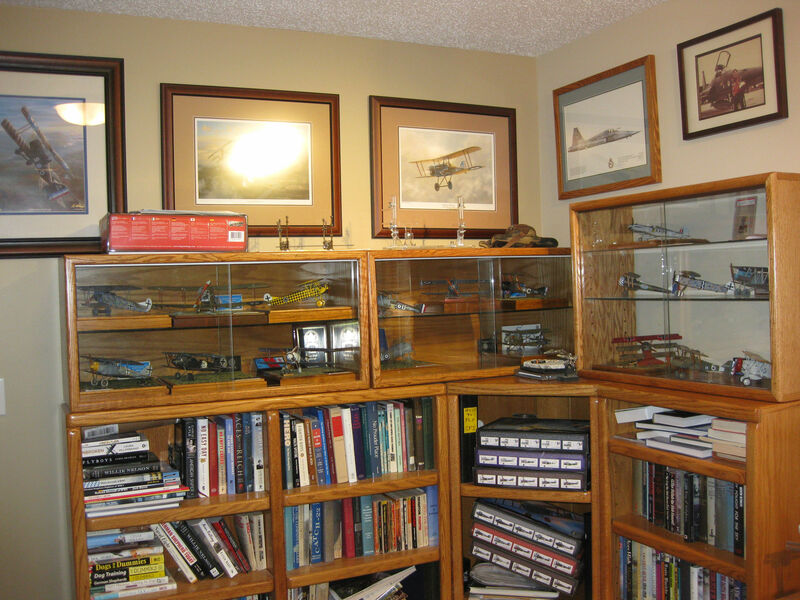 I have a couple of glass cabinets in my lounge, and some purpose built perspex cases in my work room for displaying the models. 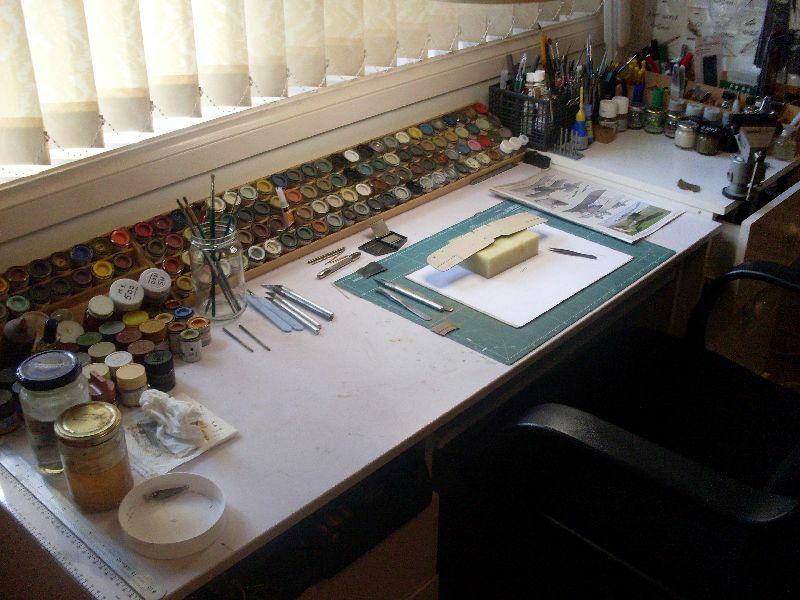 I know that compared to those modellers who work on the dining room table/lap I am lucky! You can see how untidy my desk is all the same...... but as a psychologist once told me, a tidy desk is the sign of an untidy mind! Ouch, this is going to be embarrassing! Welcome to Disaster Central... always lots on the go, any subject or scale! The tiny bit front center is where the work gets done. Haven't built a WW 1 subject in some time , but I do come by every day and see what folks are building and I must say that this is the most active site ! Hard to keep up with all the builds . Nice to see all this "happy places". 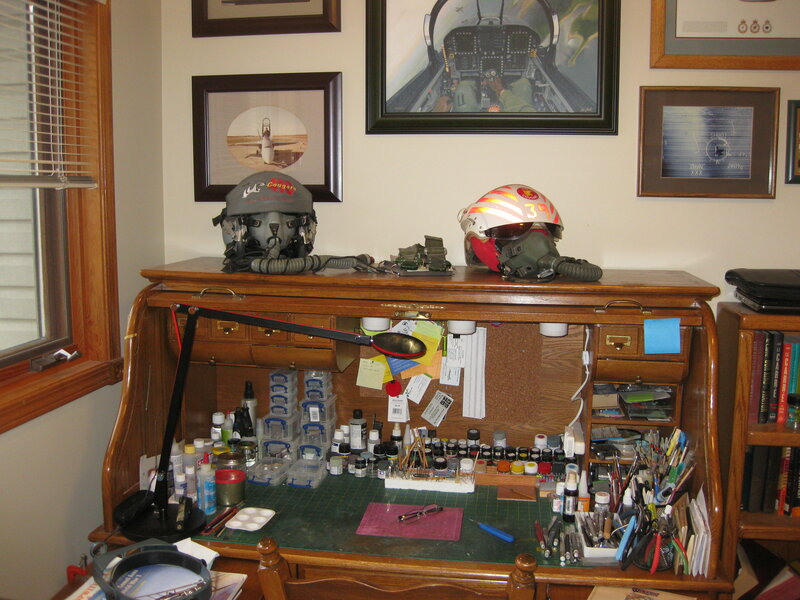 Here is my "Man cave". 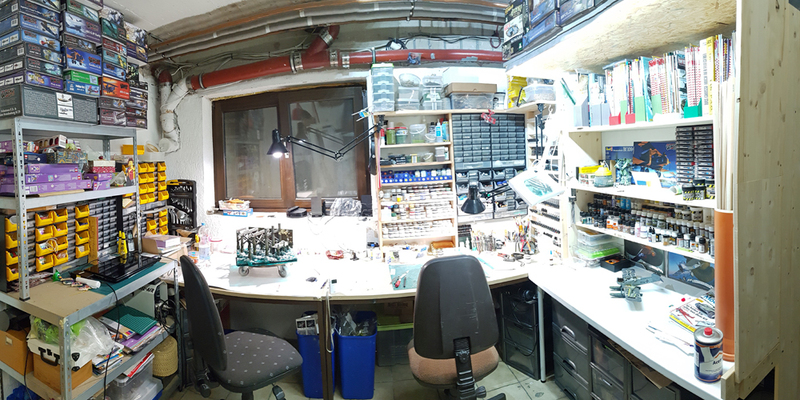 Most parts of it are build by myself.Fortunately, I recently cleaned up my desk and was able to take a picture before it disappears under all kinds of stuff again. The left half is currently besieged by my wife she is making photo albums, cards and other women's stuff. ... my lifetime collection of "I love me" photos and keepsakes ... . Excellent "space", Lance. What airplanes did you fly ... F-5, etc. A long time on the CF 101 Voodoo, the Canadian version of the F.5, and a final 7 years on the F-18 Hornet. I consider myself a very lucky Guy, I loved every minute of it all! I really like this thread! 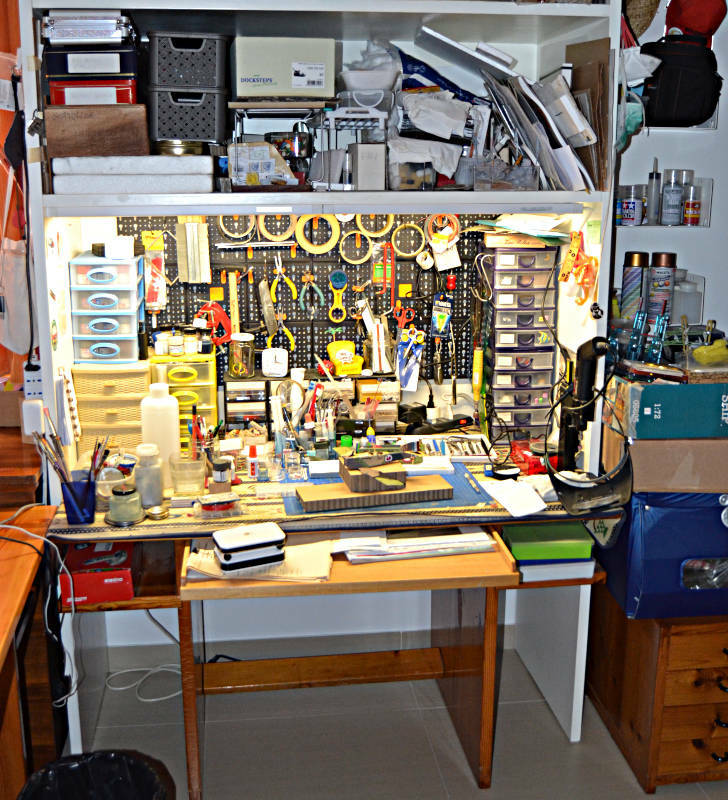 No I'm also able to show my workbench. In the middle the main workplace below the roof window (the daylight is great), on the right storage and some small machines. On the left side my lathe. The "hobby zone" modules in the middle are really nice! Wikipedia says: A model is a simplified representation of reality. So I create downscaled originals.